We always like to hear the view points of Professional players on footwear, so we caught up with Everton’s Anton Peterlin for a Q&A session. Anton went to college at Cal Poly, San Luis Obispo before spending a season with Ventura County Fusion in the PDL. 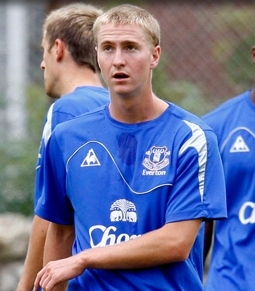 From there, he signed with and currently plays for English Premier League side Everton. What cleats you were wearing before you left? What cleats you are currently wearing? What types of surfaces are you currently training on? We have grass and artificial turf fields. What differences have you encountered in games in terms of what you have worn? The durability of the Pumas are better, but the Adipures are a lot softer. I assume you are playing in wet and muddy conditions, what steps are you taking to keep your boots in good shape? I wash my own boots after each training session and i try to once a week and put some leather food on of some sort. But the key thing is to get rid of the mud as fast as possible with as little water damaging the boot’s integrity. How have games been going, and how is life on Merseyside? One of the recent games we played was against Sunderland’s reserve team and we tied 1-1. The pitch was completely drenched from the rain and as a result I had to wear studs. They performed very well. I am playing in the middle of the park in more of a holding role as a bruiser. Life in the UK is definitely different than the states, with having to acclimatize to the lingo and manners of people and players alike, but it is definitely a very good experience. In addition, getting used to massive amounts of rain is an interesting transition coming from sunny California. Thanks for the update buddy and keep us posted on future developments! When United finally broke the deadlock, it came amid Everton’s most fruitful attacking period. Moments after Anton Peterlin’s header had been disallowed for offside, Adam Forshaw nodded against Ben Foster’s post. Everton Reserves play Burnley on Thursday 03/04, we will have an update on how the game goes.